Shamus Plays: WoW #11: What? More Work? I'm just a humble demon. 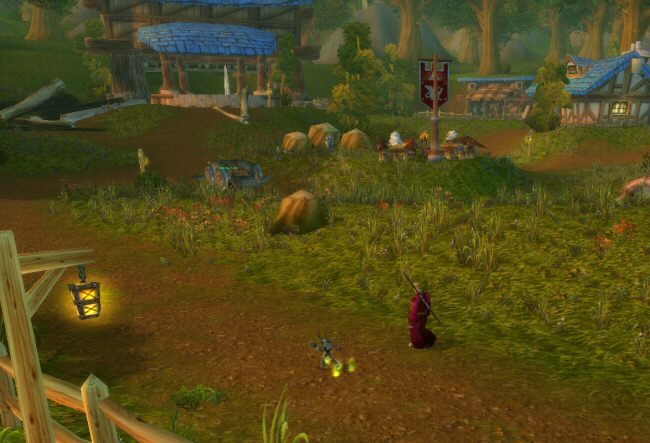 I don't pretend to know how humans live, but I do think it's odd that they call this place the Eastvale Logging camp, despite the fact that it's larger and more populated than the town of Goldshire. The logging camp has three houses, stables, a lumber mill, lots of inhabitants, and even a crowd of delicious-looking children. 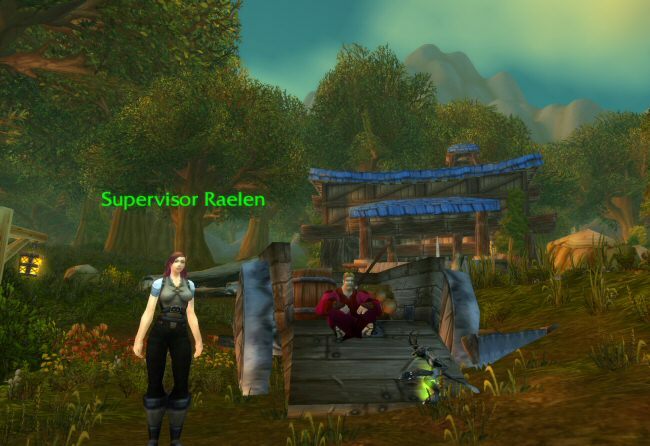 Supervisor Raelen is in charge of this little corner of the insane asylum that people call the "Eastern Kingdoms." Norman introduces himself and gives her his usual self-destructive offer of help. "I've got a real problem on my hands," she says. "I have a deadline looming for an order of lumber, and I'm running out of time. The wolves and bears north of here have forced my workers to run away from the bundles of wood that they've already chopped." "Your workers ran away from piles of wood?" I ask. Norman usually kicks me for remarks like this, but this time he lets it slide. "I need someone to go collect the wood for me," she continues. "If you could collect eight bundles of wood for me I might just make my deadline!" Norman sighs, "I see where this is going. Let me guess: you want me to go out there by myself and get torn apart by bears and wolves so that your gang of men with axes will remain safe?" "I've already talked to the guards about clearing the animals," she adds. "Oh? Well, then, splendid!" Norman says with surprise. "We'll wait until they're done." He sits down and makes himself comfortable. "Hey genius," I say. "That's you." "The person clearing the animals. Remember earlier? Guard Thomas asked you to kill a bunch of wolves and bears? Obviously she asked him to do it and he passed the job to you. You're waiting for yourself." We hike into woods and begin killing wolves. This quest used to really irritate me, pre-Cataclysm. See, originally they asked you to kill "prowler" wolves. The problem was that prowlers only appeared in this one spot. All around were other wolves that looked the same and were the same level and were just as close to the camp, but only the prowlers counted. Often people would drift a little too far and end up killing the wrong animals for half an hour, wondering why they weren't making any progress. With Cataclysm, they removed silly restrictions like this. 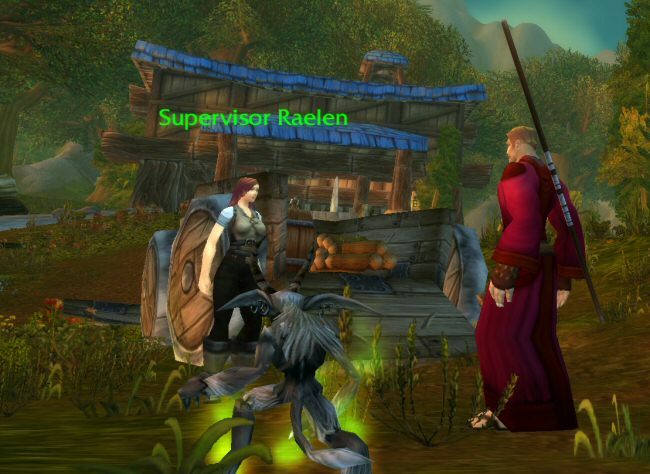 They also added a nice feature where important mobs have their names always appear over their heads. This makes it easy to sort out the stuff you need from the stuff you don't. Burning fur is not my favorite smell, but after a couple of hours you kind of get used to it. We go through the woods and end up bumping into the Murloc village again, then we turn around and work our way back.